Australia is the first country to pass laws enforcing the use of plain olive green packaging for cigarettes — a color that research indicates is the least appealing for smokers. Starting in December 2013, the law also proscribes cigarette companies from using their trademark brand logos on packaging, allowing only for the brand name to be displayed in small font. 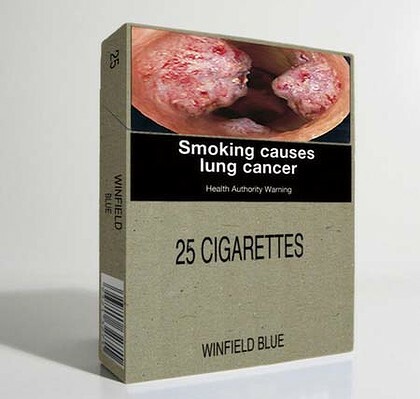 Further, 75% of the front and 90% of the back of the boxes must depict warnings and graphic images of the detrimental health effects of cigarette smoking. Well, here’s to hoping that this new marketing technique will actually work to dissuade smokers from picking up a pack. Maybe we’re too cynical, but we can easily imagine rebellious teenagers picking up the army green pack of smokes covered in gruesome images, and trading the different designs with friends like they’re Pokémon cards.